Is graffiti artist Banksy being hypocritical with his "One Nation Under CCTV" art ? Former street graffiti artist "Banksy", whose often witty stencil graffiti artworks, now fetch hundreds of thousands of pounds in art galleries, is being credited with a new wall painting in London, which appeared over the weekend. The Daily Mail spins the story from the angle that this is supposed to be a secure parking area for Post Office vans, with a big fence and at least one CCTV camera (circled), supposedly guarded around the clock. However what strikes us is the ambiguity of the slogan and the image, which seems to tolerate the idea of fascist / communist style mass surveillance and sloganeering. The figures of the private security guard and the dog (see next image) at the bottom left, are not trying to prevent the figure on the ladder from painting the slogan, they are looking on passively or with approval, whilst taking their own photo of the painter. What is really annoying about Banksy and this particular piece of grafitti art is that he recently donated an artwork, which raised £195,000 at auction, to support the re-election of the notorious Ken Livingstone as Mayor of London, Hopefully the name of this anonymous purchaser / donor will be revealed in the election expenses returns. Livingstone is a manipulative Labour politician, and an admirer of the Cuban and Chinese police state dictatorships, and of other terrorist supporting extremists, whose Transport for London and Policing policies have vastly increased the amount of CCTV and other surveillance, which is being inflicted, unaccountably and in secret, on innocent travellers and residents in London. Ken Livingstone deliberately refused to appear at, or send a deputy, or provide any written answers to the Questions about the Database / Surveillance State issues put to the other main Mayoral candidates at the recent cross political party NO2ID Campaign organised Database State Mayoral Election Hustings on the 8th of April - he ended up appearing as a "Cardboard Cut Out Ken". In that context, the location and timing of this "Banksy" looks to be supportive of the Labour Party surveillance and control cliques, rather than being in any way on the side of the angels, or of the majority of the unnecessarily snooped on public. 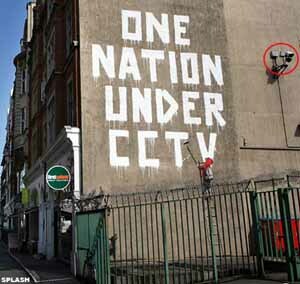 Continue reading Is graffiti artist Banksy being hypocritical with his "One Nation Under CCTV" art ?.